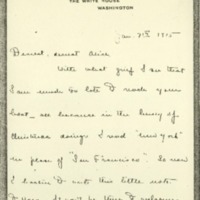 Jessie writes to her friend Alice, who is traveling to Korea with her husband, about her pregnancy, the Wilson family’s Christmas gathering, and Woodrow Wilson’s travels in Europe as World War I begins. With what grief I see that I am much too late to reach your boat—all because in the hurry of Christmas doings I read “New York” in place of “San Francisco”. So now I hasten to write this little note to Korea. It won't be there to welcome you but I hope it will follow you very, very closely, and, in the midst of your settling down and arranging all your little things about you, make you feel that I am putting my arms around you and whispering love and hope and prayers for your work and life and happiness in the new environment. How long ago that little glimpse of you in July seems now, and how thankful I am that I have it as a constant blessed memory!Much has happened since then. Joy and sorrow have taken hands and visited me together and both are so strangely intertwined that where one begins and the other ends it is impossible to state. All I know is that God is infinitely good and that every experience reveals Him more fully and satisfyingly to my heart. When you receive this letter there will in all probability be a new little soul on earth. It seems too wonderful and miraculous, doesn't it? These days of waiting are very, very precious. About the 20th of January the happy time should be. Our Christmas was a peaceful home Christmas, with Father well and serenely beautiful in spirit. Frank has just gone back to college and I am left here, to share my coming happiness with the dear people here. I have been frightfully cut off from any YW work, necessarily so, but of course I miss it. I had a little mission-study class on “Anne of Avon” in the church which was a great pleasure to me, but how little work! However we must be content to wait and to do the “next thing” whole souledly. John R. Mott was here last night to tell Father of his experiences recently in Germany, France, and England. How I longed to hear him, Father being too busy to give a full report. He has been seeing every spiritually minded leader in those three nations, rallying them to the support of real Christianity, and so organizing the dismayed forces of spirituality and brotherly love. He had bishops, whose fiery sermons have been startling everyone, weeping and on their knees in penitence. Just a little glimpse of what he said as Father reported it!! Oh yes—he also felt assured that judging from the attitude of people there now, the sense of Oneness, of all being in one community bound together by a commone experience, the eagerness to help each other at all sacrifice every where displayed, that this war will produce a great spiritual awakening and deepening. In fact he struck a note of profound optimism. Sayre, Jessie Woodrow Wilson, 1887-1933, “Jessie Woodrow Wilson Sayre to Alice Appenzeller,” 1915 January 7, WWP17511, Jessie Wilson Sayre Correspondence, Woodrow Wilson Presidential Library & Museum, Staunton, Virginia.